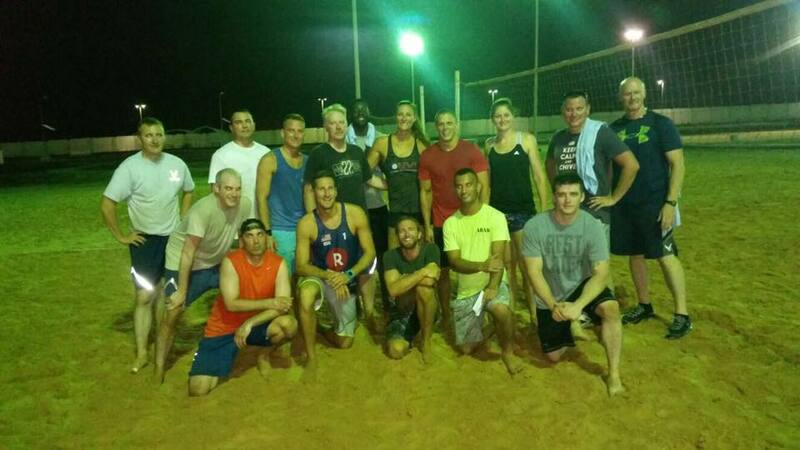 How did you break into the world of beach volleyball? My story is not so atypical. I played volleyball in gym class, just like everybody else. I was first introduced to beach volleyball in northern Michigan. But at the time, it was still considered “a girly sport.” My focus was mountain biking. Michigan was a little sleepy when it came to sports and business, and the nine months of cloud coverage was slightly depressing. For that reason, I moved out west to California. I wanted to move somewhere I could challenge my mind and body. I didn’t start taking beach volleyball seriously until I was 25. 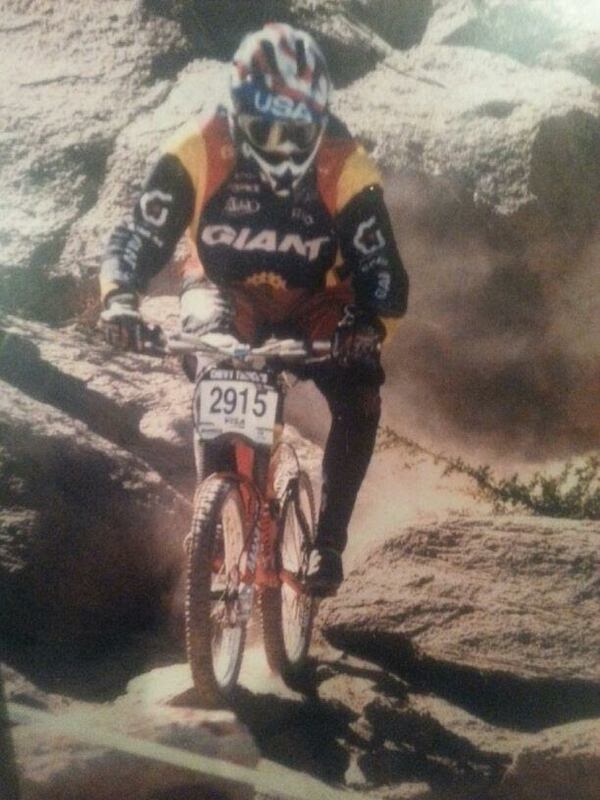 I was still racing bikes when I moved out west. How has California challenged you in the business realm? I like doing deals – everything from developing restaurants to real estate. I love to apply the concept of strategy to my work in the closing of negotiations. In California, I’ve encountered some great creative businessmen with creative minds. The more competitive the marketplace, the more creative you need to be. Have you noticed any crossover with this in sports? Absolutely. I’ve been playing this game called Stratego that strengthens my strategy on and off the courts. (It’s an app; check it out.) It is a combination of Chess and Poker. The further ahead you are mentally, the higher the chance you’ll win. Volleyball has many strategy and mental components to it, like chess. If you know what your opponent’s tendencies or mental weaknesses are, you can channel them into doing what you want them to do. Volleyball is about predicting forward, and when you do that correctly, you have a massive advantage before you even start the game. It is the same with business negotiations. If you do your research and you have an idea of what they are going to say, then you can stay ahead of the negotiation and you’ll be more likely to get what you want. But my favorite deal and negotiation is one where both sides walk away happy. I am a strong believer in abundance in this world – there is enough for everyone. Do you feel other beach players have a good handle on this ideology? Some of them do. I was watching the Olympics this morning, the Canadians vs. the Brazilians, and a lot of the time is comes down to two points at the end of the match. Throughout each match, you are gaining information about the other team. How many times did he hit angle? How many times did he hit line? What did he do when he was in trouble? If you keep track, or have a coach helping you to keep track of these things, then by the end of the match you’ll have collected really valuable insight and those last two points become everything. More often than not, it’s all about the end game. Crafty strategy players will test different areas. I read online that your biggest influence in the sports realm is Mike Whitmarsh. What makes him stand out as an athlete? We are similar in that we both got a late start to the sport (both qualifying for our first pro beach events in our late twenties). He came from a basketball background and had a quick rise to the top of the beach volleyball world. He has great athletic ability and, like most successful people, an ability to learn quickly. How did you become involved with the National Volleyball League? Dave McKienze and I made the finals in the NVL in Cincinnati, Ohio in 2012 and we both had a great time there. I committed to the NVL full-time last year in 2015. I really enjoyed the personal family environment that the NVL offered. It is a very supportive group and it is a ton of fun. I keep thinking back to that Cincinnati tournament. After the games ended, we played co-ed Ace and did laps in the lazy river as the sun set and it reminded me what I love so much about the sport. What advice would you give to athletes who’ve also had a late start in the sport? Play as much as possible and play against the best possible players. In Michigan, it capped out at a certain level of play. There are only a few high level players. If you’ve never passed a sky ball from Carambula, you will probably get totally embarrassed on your first few attempts. If you’ve never teed off against Dalhausser’s block, he’ll likely put you in the closet. 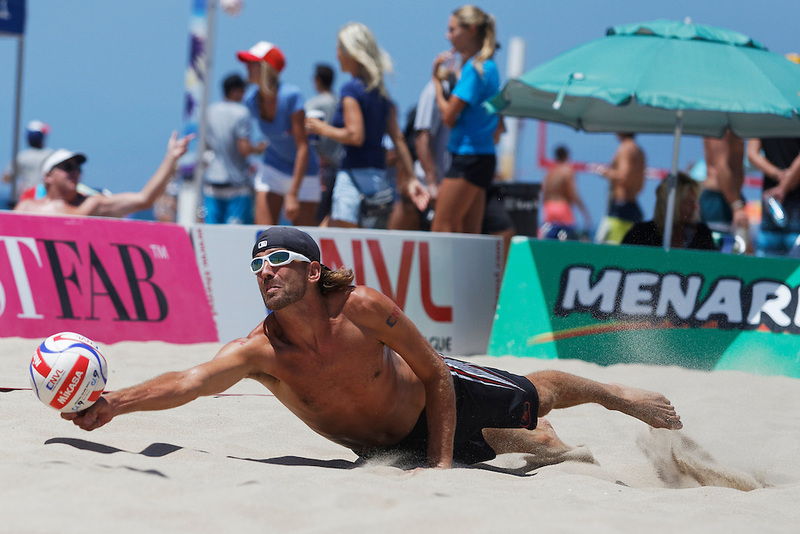 In California, if you are good, you may get the opportunity to play against the best players in beach volleyball. Be open to playing with different guys and don’t be afraid to pick up the phone to ask people to train with you. I maintain the courts at my house, supply lines and antennae and bring the balls if people want to come here to train. It is easy for me to do and it is more efficient. Additionally, I am playing with new faces all the time. My other advice would be, if you’re trying to play for money, set up some income streams on the side before you commit to hitting the road. It is no secret that it is tough to make money in this sport right now. Set up some sort of entrepreneurial plan to keep yourself afloat. I see some younger players trying to make a career funded on credit cars and that can be really stressful. That is some great advice. Your son Logan will be lucky to receive that insight as he grows as a person and as an an athlete. Tell us more about Logan and the work/life balance! Logan is great. He is nine-years-old and played in his first volleyball tournament this year. 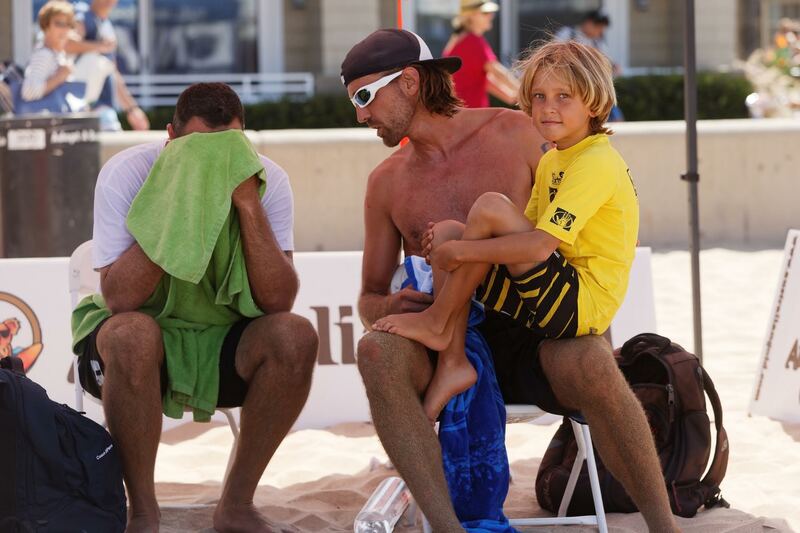 Work/life/son/volleyball balance has its challenges but I have a good time with it. I enjoy the busy schedule and it is fun having someone near all of the things that you like to do. It gives you some good insight into how to live your life. He will be in Hermosa cheering me on. What are a few valuable lessons you’ve learned from Logan? Kids do things perfectly when they are very young; posture, walking, breathing, emotional expression, etc. When you sit at a desk all day, things change. I’ve learned how to be a little more raw and natural from him. When he is angry, happy, frustrated or experiencing love, you see his pure emotions right on his face and in his demeanor. He has helped me to be a little more in touch with my emotions. The biggest lesson he has provided me is to experience emotions, be present with them, enjoy them and move on. What should we expect to see at NVL Hermosa? I will be playing with Drew Mallin. We started playing together at the NVL San Antonio, but found our stride in Columbus, finishing third. We are going back to the basics. Whenqualified for my first pro event, that was built on tough jump serves. I would get 203 aces or points that stemmed from a tough serve. When you serve hard, you can get more blocks and digs. We are going to be bringing fire and energy hopefully dominating my home beach!